BRUNSWICK, Maine -- A viral video of a whale allegedly protecting a marine biologist from a shark has some Youtuber users questioning its validity. Marine biologist Nan Hauser believes a humpback whale shielded her from a 15-foot tiger shark in the South Pacific this fall. Hauser said she didn't understand the actions of the 25-ton whale that she met face-to-face in the Cook Islands. She said she swam up to the animal and it started to push her through the water. Not wanting to upset the mammal, Hauser just stared and tried not to make sudden movements. It wasn't until later that the film crew told her what happened - a shark was in the area. The encounter took place in October, but Hauser didn't upload the video to Youtube until Monday. "The stunning video and images Nan Hauser and her team were able to capture - including point-of-view footage - show how the whale pushed whale biologist Nan with his head and his mouth, tucked her under its pectoral fin - even lifted the biologist out of the water on one occasion." Her research companions claim they turned off an underwater video drone, fearing she was going to be mauled to death - which would have captured the proof viewers wanted, knowing the shark existed. Hauser, president of the Center for Cetacean Research and Conservation, told the Portland Press Herald that whales are "altruistic" and often hide seals from predators, but she has never experienced or read about anything about a whale protecting a human. "If someone told me the story, I wouldn't believe it," she said. She suffered some bruises and scratches but was otherwise unharmed. After her encounter, she said she swam back to her boat and the whale surfaced nearby as if to check on her. While Hauser is convinced the whale saved her, others aren't so sure. 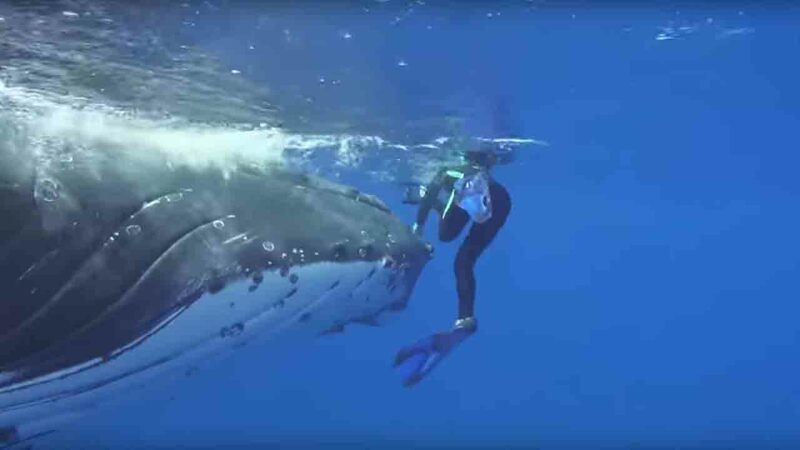 James Sulikowski, a marine biologist and professor at the University of New England who has studied tiger sharks, said he's not convinced that the whale saved her life. "The shark could have just been hanging around," he said. "There's really no way of knowing the whale's motivation."